Tiberius' Sacred Santuary: Capri's Blue Grotto. Hours: 9 a.m. to 5 p.m. daily. The grotto is closed to visitors during rough seas or high winds. This is the most famous sight on Capri, where visitors from around the world form long queues to get a peek inside for just a few magical moments: we're talking about the Blue Grotto, of course. This natural cavern is 25 meters wide and 60 meters long, with a tiny entrance less than a meter high. To enter, visitors lay back in wooden rowboats and glide through the low cave mouth. Once inside, the boats bob in the dark, suspended on the surface of water so blue that it seems dream-like. Floating in the Grotta Azzurra is an experience that should be on any traveller's bucket list. 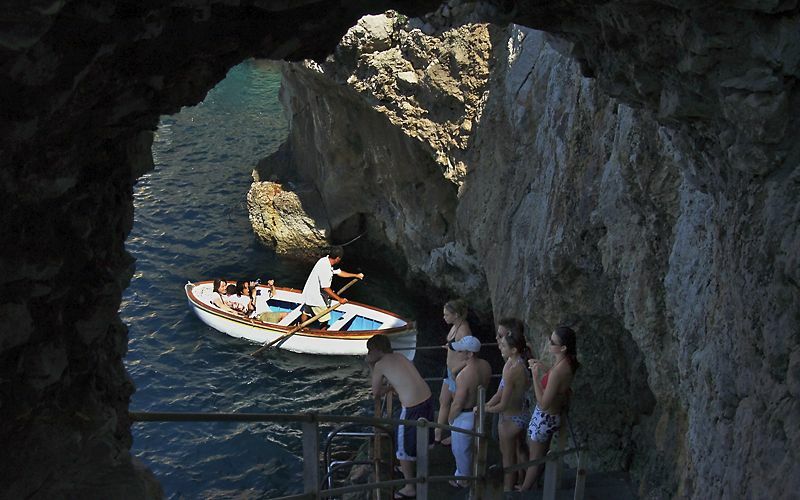 Entrance to the Blue Grotto is possible only by boarding small rowboats which hold a maximum of four passengers at a time. The entrance ticket must be purchased at the floating ticket office at the cave entrance. After purchasing your ticket, your skipper will ask that you lay back along the bottom of the boat to enable the group to pass through the tiny mouth of the cave. Once inside, your skipper will row you around the cavern, singing traditional Neapolitan folk songs which echo off the rock walls and create an unforgettable atmosphere. By tour boat: from Marina Grande, the Motoscafisti, Laser Capri, and Capri Cruise boat charter companies depart with organized group tours of the island of Capri and stops at the Blue Grotto. Tickets cost around EUR 18 (tickets to enter the Blue Grotto must be purchased separately). These tours take about 2 hours. More information about tours of the island by sea. The Motoscafisti charter also offers round trip transport to the Blue Grotto from the port. Tickets for this service are EUR 16 (in addition to tickets to enter the Blue Grotto) and the trip lasts about an hour. By rental boat: from Marina Grande, visitors can hire a gozzo (the traditional boat of Capri) with skipper for a tour of the island by sea and a stop at the Blue Grotto. Private boats can usually transport up to seven passengers and cost between EUR 150 and EUR 200 for three hours. By private boat: if you are visiting Capri on your private boat, you can anchor near the grotto (there are a number of buoys near the entrance) and call for a boat to transfer you to the grotto entrance. By land: the cave entrance can be reached by land from Anacapri: Take Via Pagliaro from the center of town, then Via Grotta Azzurra. At the end of the road, follow the stairs down to the grotto, where you can board the rowboats. The walk is about 3.5 km (40 minutes downhill) from Anacapri, or there is a bus line which leaves from Piazza della Pace in Anacapri and reaches the cave in 15 minutes. How long is the cave visit? 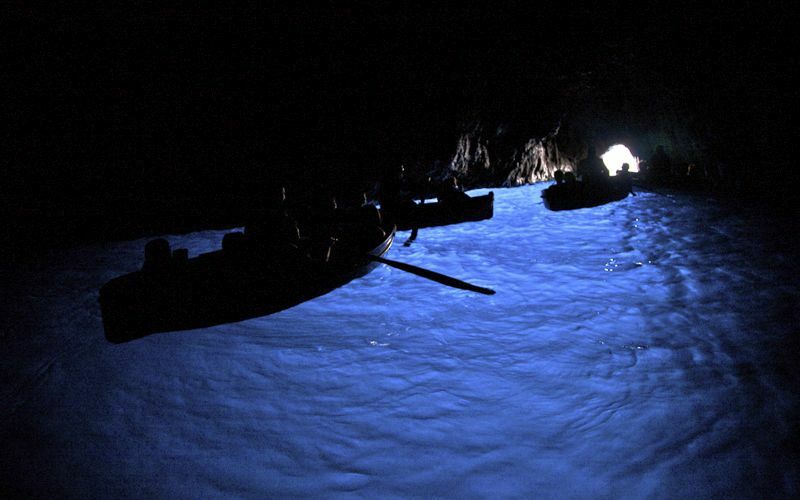 Rowboats stay inside the Blue Grotto for about five minutes. That said, the line to enter the cave is often quite long...in high season, wait times can reach two hours. 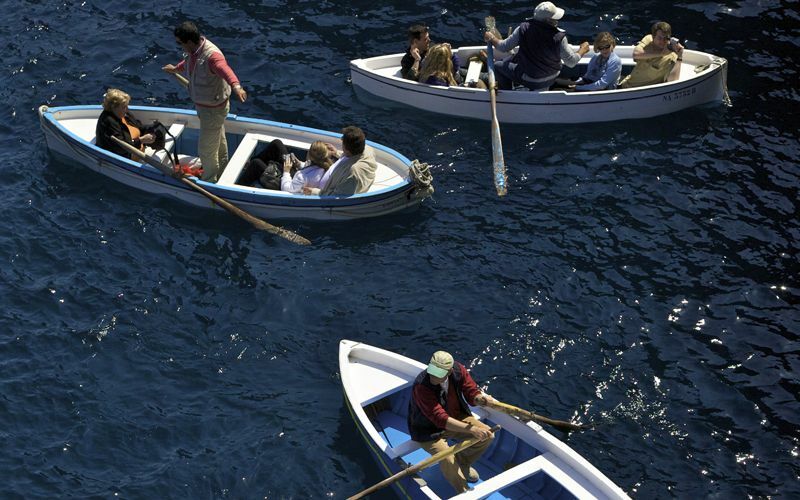 Can visitors swim in the Blue Grotto Capri? No, visitors can neither enter the cave by swimming nor disembark from their rowboat to swim inside the cave. However, after the cave closes to the public at 5:30 p.m. (when the rowboats and ticket office close), many swimmers enter the cave by sea. This is both illegal and dangerous, as the cave mouth is low and narrow and in case of high waves it is easy to get thrown against the rocks. When is the best time of day to visit the Blue Grotto? The glowing effect of the water inside the Blue Grotto is due to the sunlight which enters through a second, underwater cave mouth beneath that on the surface. For this reason, the most intense color comes with the most intense sunlight during the midday hours of noon to 2:00 p.m.. The difference between the first morning light and the late afternoon light is negligible, though there is often a longer line in the afternoon. It is best to avoid visiting the grotto on overcast days, when there internal glow is much less dramatic. How much does it cost to visit the Blue Grotto? The EUR 15 ticket includes the entrance fee (EUR 4) and the cost of the rowboat transport (EUR 11). Children entrance under 6 years old: free. EU citizens under 18 pay EUR 11 for the rowboat transport. For EU citizens between 18 and 25 years of age, there is a discount of 50% on the entrance fee, for a total of EUR 13. The rowboat skippers are often tipped. The ticket price is in addition to the cost of a boat transfer to the cave entrance, which is about EUR 18 for a full island tour by sea or EUR 16 for a round trip ticket just to the grotto. Is the Blue Grotto ever closed due to weather? In case of rain or rough seas, it is not possible to enter the Blue Grotto. It often happens that the cave can close and reopen in the same day, according to the weather, or that the weather seems calm but the grotto is closed due to adverse winds. To find out if the grotto is closed at any given time, call the Motoscafisti di Capri pier by dialing 081 8375646 after 9 am. Unfortunately, it's not possible to foresee closures due to weather, though the grotto is usually kept closed when the weather forecasts high wind and waves. Is the grotto closed in winter? The Blue Grotto is open all year round, weather permitting, though it is often closed from November to March. If visiting in winter, it's best to check first either at the ticket offices of Laser Capri (Molo 21) and Motoscafisti di Capri (Molo 0) in Marina Grande, or by calling 081 8375646 after 9 am. If the ticket offices are closed, the grotto is closed, as well. 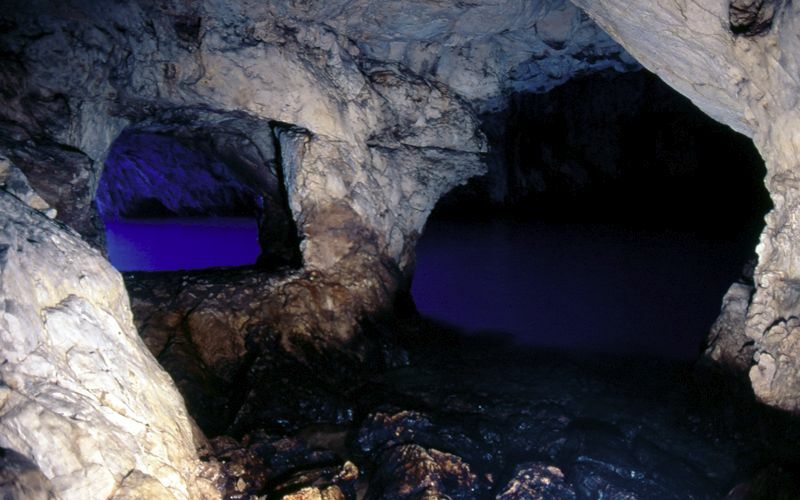 This sea cave was known during the time of ancient Rome, when it is thought that the Blue Grotto was one of Emperor Tiberius' favorite nymphaea, or temples dedicated to sea nymphs. Inside the cavern, a number of statues have been found dating from that period. 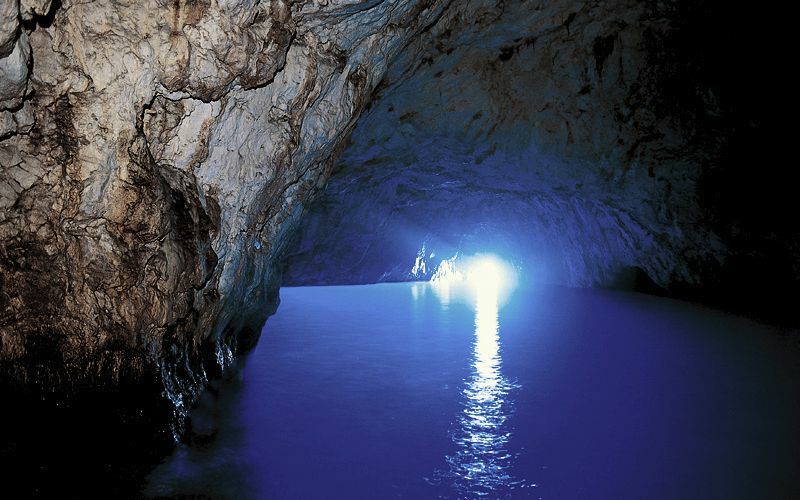 For many centuries, the Blue Grotto (also known in the past as the Grotta di Gradola) was abandoned, feared by the local sailors because of legends of spirits and demons which inhabited the cave. This changed dramatically on April 18, 1826 when the cave was "rediscovered" by the German writer August Kopisch and painter Ernst Fries, his friend and travel companion, who were taken to the cave by Angelo Ferraro, local fisherman, and notary Giuseppe Pagano. By boat: 10 minutes from Marina Grande or as a stop during a tour of the island. By bus: from Anacapri, 50 meters from Piazza Vittoria. On foot: follow Viale T. de Tommaso, Via Pagliaro and Via Grotta Azzurra (3.5 km).